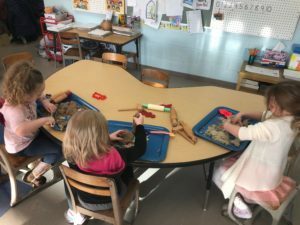 The North Shore Community School Preschool program is a gentle and open learning experience for children ages 3-5 years old. We offer a traditional approach to early learning in our preschool environment. Through child led free play and guided learning activities, as well as hands on group project learning, problem solving skills and creativity, learning about the world around us is achieved. The children have many opportunities for emotional, physical and educational growth. We promote kindness, respect and inclusion towards all children in our preschool environment. Because we are an environmental charter school, the children have access to the beautiful school forest and geothermal attached greenhouse where we spend a lot of time exploring. Much of the natural elements are a part of our learning experience and flows into our classroom environment. Our preschool program goes from Mid-September to Mid-May. We operate Monday through Thursday from 9:00 a.m. to 2:45 p.m. We offer schedule options that will fit your family’s needs. Choices for schedule options are as follows: half day programing 2,3 or 4 days per week, from 9:00 a.m. to 12:15 p.m., for full day programing 2,3 or 4 days per week, from 9:00 a.m. to 2:45 p.m. Registration for the 2018-2019 school year is now being accepted. Each schedule option has a monthly tuition charge as well as a one-time registration fee of $25.00 and a supply fee of $40.00. For more information, please call 218-525-0663 ext. 106. Parents considering preschool please note that children must be fully toilet trained before entering the preschool program. Current Preschool parents should note that preschool children must go through the enrollment process to have their children attend Kindergarten at NSCS. Enrollment is not automatic for children currently attending NSCS Preschool.